Halfbeak (SS-352) was launched 19 February 1946 by the Electric Boat Co., Groton, Conn.; sponsored by Mrs. William Craig; and commissioned 22 July 1946, Comdr. Evan T. Shepard in command. After shakedown in the Caribbean and along the Latin American coast to the Canal Zone, Ecuador, and Colombia, Halfbeak spent the next 3 years in training operations and fleet exercises out of New London, Conn., where she was part of SubRon 8. Entering the Portsmouth, N.H., shipyard 12 September 1949, Halfbeak was converted to a "Guppy" type. Fitted with a snorkel to enable her to stay submerged for long periods of time and distinguished by a greatly streamlined superstructure, Halfbeak left Portsmouth 13 January 1950 to work with the Research and Development Group at New London. While con ducting tests on special underwater sound equipment, she made a cruise to English waters, operating off Jan Mayer Island, in the winter of 1951. Halfbeak was engaged in further Caribbean exercises until 10 November 1954, when she sailed for her first Mediterranean cruise. Having- visited Gibraltar, Naples, Marseilles, Lisbon, and Valencia, Spain, the submarine returned to New London 2 February 1955. A similar cruise in 1956 was punctuated by the Suez Crisis, and Halfbeak remained in the eastern Med operating with the 6th Fleet until January 1957 helping to maintain the peace in that crucial region. Her duties took another turn as 28 July 1958 she departed for the Arctic, where with the nuclear submarine Skate she operated under and around the polar ice pack to gather information in connection with the International Geophysical Year. During these operations, Skate sailed under the Arctic ice pack to reach the North Pole 11 August and continued to cruise freely there repeating the visit 6 days later. 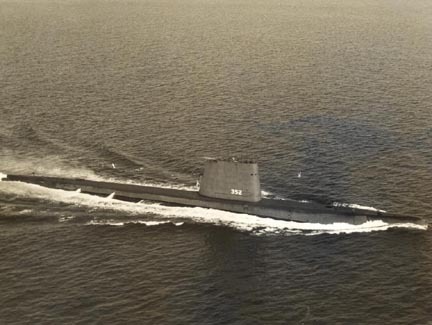 Local operations and exercises, primarily submarine and fleet maneuvers in the Caribbean but also NATO maneuvers, occupied Halfbeak until 1963, when she resumed her role testing and evaluating sonar and other underwater sound equipment out of New London.